The adult armyworm (Pseudaletia unipuncta), is a moth captured in Maine in light traps in late April and early May. The female moth mates and begins laying eggs in mid-May. The eggs hatch in approximately 10 days, depending on temperature. Larvae feed for 3-4 weeks and then pupate in the soil, emerging as adult moths in about 2-3 weeks. This process is repeated again producing a third generation. In September this third generation of nearly full-grown caterpillars spend the winter in the soil. In the spring the caterpillars finish growing and pupate from mid-April to early May. In 2-3 weeks the moths emerge and lay first generation eggs. One female moth can lay several hundred eggs. When full grown, the caterpillars can be almost 1.5 inches long. The caterpillars are usually greenish or brownish, but can also be almost black. The sides and back of the caterpillar have light-colored stripes running along the body. The caterpillars normally feed at night and much damage can occur before they mature. The preferred foods are grasses including corn, grains, and timothy. They will feed on other plants if grasses are unavailable. 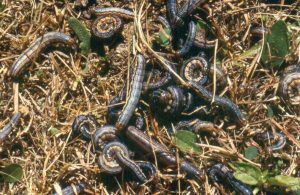 Once the grass has been devoured, the caterpillars will move in a mass into other fields of suitable hosts, hence the name armyworm. The first generation of caterpillars, those feeding in June, are usually the most destructive. Rarely are there outbreaks with the second or third generation of caterpillars. The moths are tan or light brown in color with a white dot in the center of each front wing and a dark area on the edge of each hind wing. The moths feed on nectar and possibly on over-ripe fruit. The female lays her light-green eggs at night on the underside of grasses. Many moths congregate in a local area and lay their eggs, which may lead to the first generation outbreaks. 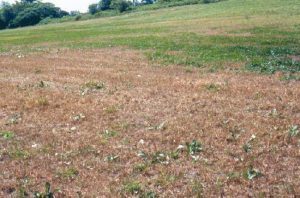 By the time the damage is seen (destroyed grain, corn, hay, or lawns) it is often too late to control the caterpillars. 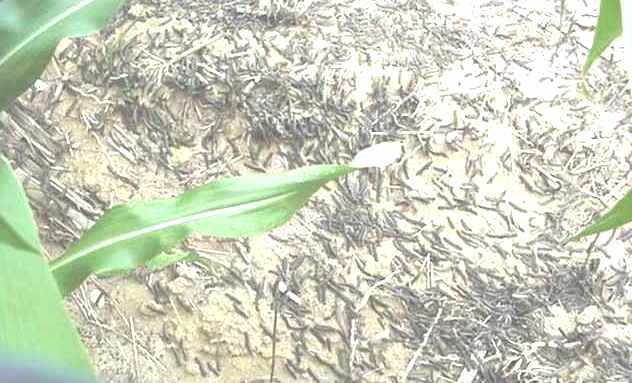 Usually by the time the damage is evident, the insects are almost full-grown and will not feed much more. However, that is not always the situation. If a spotty infestation is found in a field, a 30 to 40 foot-wide perimeter spray around the infested areas may prevent further infestation. Since the armyworm usually feeds at night, the best time to spray is late in the day. For home use, carbaryl (Sevin) may have some effect. Organic controls include pyrethrum or pyrethrins, a combination of pyrethrins and spinosad. However, the pyrethrum/pyrethrins do not give residual control. Condor® and other formulations of Bt (Bacillus thuringiensis) are effective in controlling smaller caterpillars. Be sure to read and follow the label instructions and make sure the product is registered for the intended use. Other management strategies include keeping lawns mowed short to make them less attractive to the caterpillars. If a lawn is infested, mowing it short will kill many of the caterpillars and reduce the food source. Hayfields can be mowed to salvage the crop, but many of the “worms” will survive and move on, looking for a new food source. Therefore, neighboring grasses should be protected before mowing. 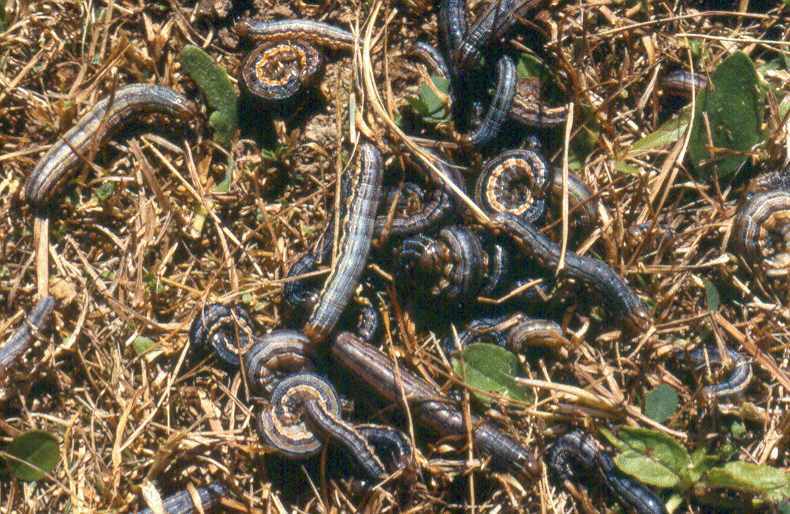 Usually when the armyworms are on the move they are fairly mature, making them harder to kill with insecticides. A field in South Waldoboro, Maine, week of July 4, 2001, showing armyworm damage. 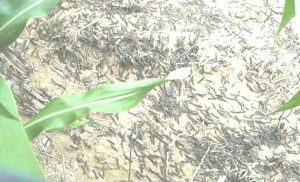 Corn field damage from armyworms in Solon, Maine. Photo by Rick Kersbergen.